It is an honor to wear a military uniform. It is one opportunity among many to serve others. It does not entitle an individual to special treatment, and should never make the military member think that ANYONE owes them ANYTHING. Military service is a privilege, and in my eyes, should be treated as such. Military service does not make you a hero. Heroes are defined by their sacrifice, not their job titles, or the clothing they wear. Heroes surrender constitutionally afforded rights, to ensure the rights of others are never trampled upon. Heroes spend years away from home, and family, to ensure yours is safe. Heroes miss holidays, birthdays, anniversaries and births to ensure that you never have to. Heroes go where others won’t, and do what others are unwilling to. When a Hero sees danger, he places himself between that danger, and YOU. 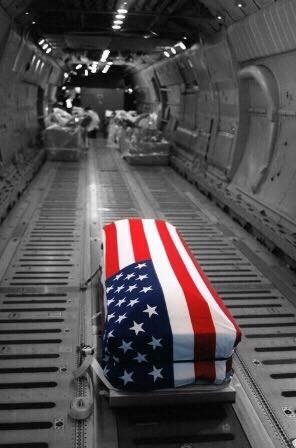 When a Hero has sacrificed more than anyone should ever be asked, they are returned to devastated families, wrapped in our flag. There is pain, sadness, anger, confusion, and a sense of loss that remains for a lifetime. Families are forced to substitute pictures for parents. Children are raised among fleeting memories, instead of making memorable moments. Some are able to move on, others never can. Heroes sacrifice not only themselves, but the unity of their family, for YOURS. Heroes bleed for our Freedom, and they die for our Liberty. Take a moment to think about who we are, and what we have. We live in a nation of opportunity. There is plenty of bad, and an incredible amount of good. We have many freedoms, some appreciated, some abused. We will never be perfect, and it is often not pretty, but it is who we are. We should not shy away from these imperfections, we should own them. We have these things because of Heroes. We stand on the shoulders of these men and women every single day. Everything we have, and everything we can be, is strengthened by their sacrifice. If you want to honor them, take the time to appreciate, understand, and most importantly, REMEMBER what it has taken to get us here. These men and women didn’t need to be asked to risk their life for us, they volunteered. Not all volunteered, but “courage is being scared to death and saddling up anyway”. Great comments. Today is truly a day to think about the thousands of men and women buried on foreign soil and our national cemeteries; so before you bite into that hamburger or take a sip of soda or beer today, look skyward and say “thank you” out loud. Maybe those standing nearby might ask who you are thanking… that would be a great time to remind them what this day is about. I’ve never been a part of your world, and I thank God every day for that. And BLESS YOU for everything the HEROES do to protect me and my family from your reality. home every time. God bless and keep you. You nailed it, as usual. Thanks Andy! FWIW, thanks for volunteering to work in the military and serving honorably, Andy. Powerfull Andy!! When you speak we all listen like school children. True words, incredible insight. Endeavor to persevere. Thanks Andy, I needed to read that. Powerful thoughts. Thank you, sir. her father in the pic, in his wwll army uniform. From a distance of Britain, I obviously cannot be fully a part of this day. However, I cannot agree more with what is said but am mentally extending these thoughts towards the military in quite a few countries. I have to say: the US is much better in understanding and support for the armed forces than Britain is in general. I’m grateful that I and my family do not take for granted those imperfect souls that are willing to lay down life for us. May God continue to help all the ‘heroes’ and all human beings in the earth ‘s lifetime. I’m honoring with deep respect……these moments is Sacred…….. Thank you for your military service. Because of men and women, like you, American remains the land of great opportunity. Yours is the best description of a hero that I’ve ever ready. I thank God for heroes like you and them every day.